Cut out the middle man this holiday season! 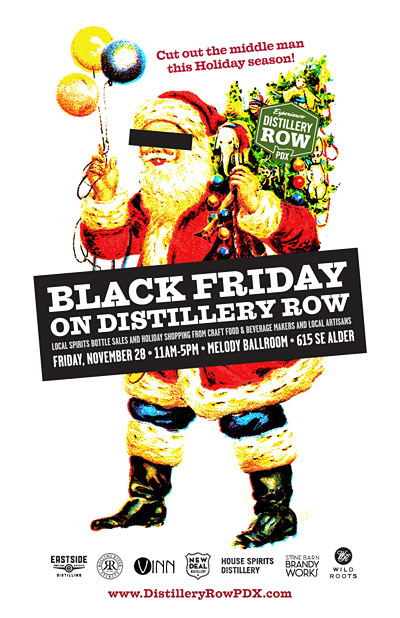 Members of Distillery Row are getting into the spirit of the season with their 3rd Annual Black Friday on Distillery Row holiday shopping extravaganza at Melody Ballroom in Southeast Portland. This free event offers a unique opportunity to sample and purchase bottled spirits from seven Distillery Row distilleries–New Deal Distillery, House Spirits, Stone Barn Brandyworks,Eastside Distilling, Vinn Distillery, Rolling River Spirits and Wild Roots Vodka–all under one roof. Also on hand will be samples and goods for sale from several of Portland’s most unique food, beverage, and crafts artisans, including Alma Handmade Chocolates, Cardamom Hills Trading Co, Alesia Zorn Calligraphy & Engraving, Lovejoy Bakers, Portland Bitters Project, Masala Pop, Marshall’s Haute Sauce, Portland Creamery, Salt & Straw Ice Cream, Smashed! Boozy Jams & Jellies, Pok Pok Som Drinking Vinegars, NW Cigars, Sage & Sea Farms, Marigold Coffee, Olympic Provisions, Mee Mee’s Goodies, Unique Gardens and more. The holidays don’t have to be all about giving to others! Come to Black Friday on Distillery Row and indulge yourself! And if you happen to pick up a few things for friends and family…well, we won’t tell. For more information go to DistilleryRowPDX or Distillery Row’s Facebook Page. Free registration on Eventbrite. Register early for a chance to win new 2015 Distillery Row Passports, shotglasses, and other goodies! “Daydream” explores the playfulness of wakeful dreaming and how the search for meaning in our lightly conscious world can reveal a new and vivid Self. She incorporates myth, the liquidity of the unconscious mind, and a profound and whimsical respect for the inhabitants of the natural world within each gorgeously wrought image.